Survival among patients with metastatic breast cancer may vary according to the site of metastasis and receptor status. We used Danish nationwide medical registries to establish a cohort of patients with metastatic breast cancer (870 with de novo metastatic disease and 3518 with recurrent disease with distant metastasis) diagnosed during 1997–2011. We examined 1-year and >1 to 5-year mortality associated with first site of metastasis and receptor expression status of the primary tumor. Cox proportional regression was used to compute confounder-adjusted mortality rate ratios (MRRs) associated with site of metastasis, stratified by receptor status. Overall 1-year and >1 to 5-year mortality risks were 36 and 69 %, respectively. Risk of death within 1 year was highest for brain-only (62 %) and liver-only (43 %) involvement and nearly the same for patients with lung-only (32 %), bone-only (32 %) involvement, and other/combination of sites (34 %). Using bone-only metastasis as reference, women with brain-only metastasis had more than two-fold increased risk of dying. The adjusted MRR for women with liver-only metastasis also was increased, though less pronounced. 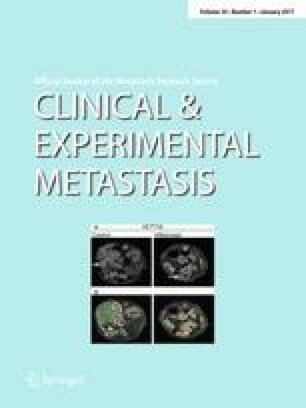 Patients with lung-only [adjusted MRR 0.9 (95 % confidence interval (CI) 0.8, 1.1)] or other metastases [adjusted MRR 1.0 (95 % CI 0.9, 1.2)] had similar mortality as patients with bone-only metastasis. Positive hormonal receptor status was a favorable prognostic factor. Metastatic breast cancer has a serious prognosis. Patients with brain-only metastasis had the highest mortality. Positive hormonal receptor status on the primary tumor was a favorable prognostic factor for all metastatic sites. The online version of this article (doi: 10.1007/s10585-016-9824-8) contains supplementary material, which is available to authorized users. HTS and AGO conceived the study idea and designed the study. HTS and UHJ established and designed the cohort. AGO reviewed the literature and directed the study-specific analyses together with HTS, which were carried out by UHJ. All authors participated in the discussion and interpretation of the results. AGO organised the writing and wrote the initial drafts. All authors critically revised the manuscript for intellectual content and approved the final version. HTS is the guarantor for the article and accepts full responsibility for the work and the conduct of the study, had access to the data, and oversaw the decision to publish. The study was funded by the Program for Clinical Research Infrastructure (PROCRIN) established by the Lundbeck Foundation and the Novo Nordisk Foundation and administered by the Danish Regions, and by the Danish Cancer Society (Grant No. R73-A4284-13-S17). The authors confirm independence from the sponsors; the content of the article has not been influenced by the sponsors.